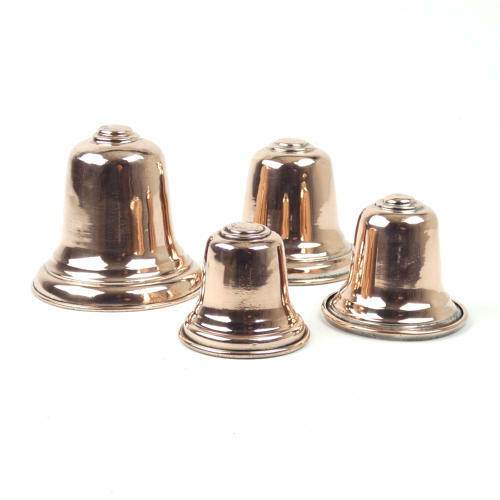 Graduated set of antique copper bell moulds. An interesting set of four miniature copper moulds in the shape of bells. These moulds are graduated in size, from the largest which is 8.5cm. diameter by 7.8cm. high, to the smallest, which is 5.5cm. diameter by 4.8cm. high. They would be good to use for moulding something for the Christmas table or for a wedding celebration. They are all made from a substantial gauge of copper and date from c.1890. They are in excellent condition and the tinning, to the interiors, is still good enough for them to be used. Price includes postage within the U.K. Shipping to the U.S.A. add £15. Western Europe add £5.